Determine the costs of insuring a vehicle in question before buying it - You may have to make an alternative choice if the premiums are too high for you to accommodate financially. 1) Shop multiple insurance companies. This is probably the most important step. Different companies charge different premiums. The easiest way to accomplish this task is to use online resources. Many of the online resources included in this section boast a minimum savings of $300 per year on insurance policies. As you will see, the main benefits of shopping online are maximum savings combined with a hassle free and quick shopping experience. You are also under no obligation to accept a quote and all quotes are e-mailed to you - no over the phone sales pressure. 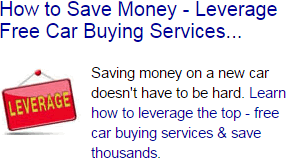 You can literally shop several insurance companies in less than an hour on all of the vehicles you are considering. 2) Select the proper vehicle. Consider a vehicle that has many safety features and anti-theft devices. If a vehicle is prone to theft or is not safe, your premiums will go up. Instead of researching many cars for this information individually, consider using the above resources and getting quotes. Money talks and an actual quote is the best way to determine affordability. How much you drive can affect your premiums. The more time on the road you spend, the higher a risk you are. Consider utilizing public transit to decrease total driving mileage, which may assist in reducing premiums. Consider car-pooling to save money as well. Try to keep all insurance policies under the roof of one carrier, as they will often offer a multi-policy discount. When getting insurance quotes, combine all your insurance needs with one company. This can save you money across the full range of insurance needs. Ensure that the policy limits cover all the drivers in the household, and that the limits are not so low to leave the individual open to lawsuits and financial ruin. Raising the deductible on the amount the individual self-insures by a total of $200-$500 will decrease the Collision / Comprehensive price tag by up to one-third. Raise the deductibles to the maximum amount you can afford will lower premiums. Finally, at the risk of being obvious, drive carefully. Accidents can greatly increase your premiums as well as cause the insurance company to refuse to renew (or, in serious cases, to cancel) your policy. Consumers should use these tips and do their homework before taking the plunge, and they will get the most complete coverage without putting a dent in their bank accounts.